I’ve been disappointed by frozen pizza for a while now. I’ve tried a bunch of different brands, and haven’t felt like I could enjoy pizza at home for a while now. I even tried making pizza from a few different GF pizza mixes, without much more success. From yucky gluten-free crusts, to bad texture, to just overall gross taste, I have had a hard time enjoying pizza since going gluten-free! 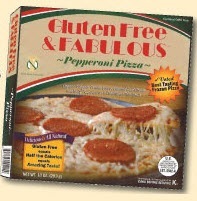 I laughed when I read the name of the frozen pizza brand: Gluten Free & Fabulous. It sooo sounds like what I would name my company if I had a gluten-free food line! But with a name like that, I thought, “It better really be fabulous!! 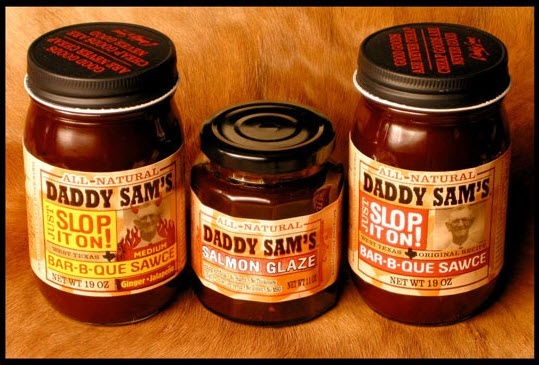 !” You can’t name your brand that and have nasty food… I would hope, at least! 1. It only took 10 minutes to bake. That is awesome. For a hungry pregnant lady that wants pizza when she wants pizza, that was a cool product bonus. 2. I usually like thick crusts but I was surprisingly just fine with this thin crust. I guess the moral of the story is that if something tastes good, it tastes good- thick crust or not. 3. It was SOOO yummy and satisfying. I think it was something in the sauce. It’s seasoned really well. That, the gooey, delicious cheese & pepperoni and this pizza totally hit the spot and satisfied my craving. …And it’s been a LONG time since frozen pizza did that. You really gotta try this FABULOUS gluten-free pizza if you have been missing this yummy comfort food on weekends or movie-nights at home. If you can’t find Gluten-Free and Fabulous at your local grocery store in the all-natural frozen foods section, try going to the Gluten-Free & Fabulous ‘Where to Buy’ page… And request it at your grocery store if they don’t stock it! They’re SO worth it and totally tasty! Ps. What frozen pizza brands do you love? Or do you have a local pizzeria near you that makes AMAZING gluten-free pizza? Give them a shout out and leave a comment on this blog article so that others near you can drop in and eat some yummy GF pizza when their cravings hit too! You don’t have to wait until Cinco De Mayo to start your spring fiestas! On a beautiful sunny day this spring, make it a Mexican-food night and indulge in this ridiculously yummy gluten-free chicken quesadilla dinner with an upgraded, shi-shi version of regular ol’ salsa and guacamole dip! 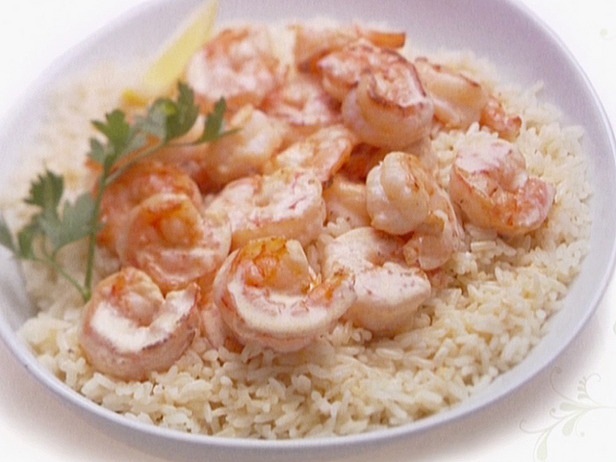 Place a large nonstick skillet coated with cooking spray over medium-high heat until hot. Add shredded carrot and onions; sauté 5 minutes or until tender. Sprinkle 2 tablespoons shredded cheese over each of the tortillas, and divide carrot mixture evenly over tortillas. 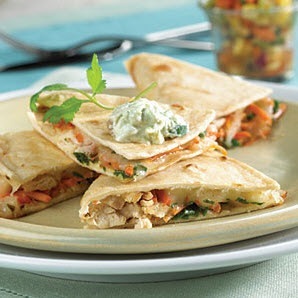 Top each tortilla with 1/2 cup chicken, 2 tablespoons cilantro leaves, and 2 tablespoons cheese, and top with a tortilla. Place skillet coated with cooking spray over medium heat until hot. Add 1 quesadilla, and cook 2 minutes on each side or until quesadilla is browned and crispy. Repeat with the remaining quesadillas. Plate and top each quesadilla with 2/3 cup Fruit Salsa and about 3 tablespoons Avocado Cream. That’s why I was excited to try Taylor’s Italian Chicken recipe from BetterRecipes.com. This Italian-inspired chicken dish is gluten-free and simply topped with fresh parsley, garlic, tomatoes, lemon juice, mozzarella cheese, and bacon. Yummy! It’s funny how bacon can seem totally fatty and cheap, yet other dishes make bacon seem totally chic. This is a recipe where bacon seems glamorous and really makes this chicken dish taste good. With only a few ingredients, Taylor’s Italian Chicken is incredibly easy to make and looks divine on a plate. 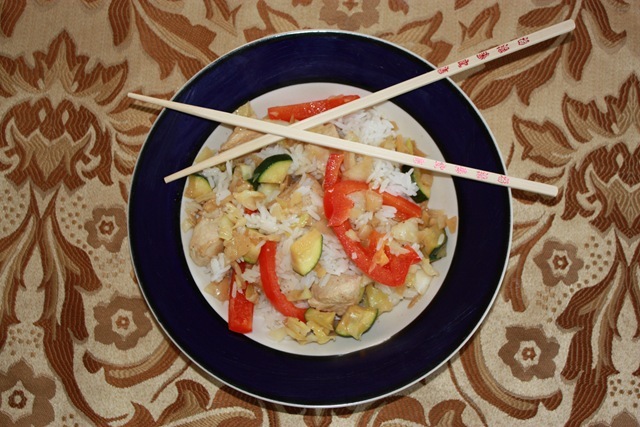 * As always, use organic ingredients when you can to create a better-for-you, tastier version of this dish! Preheat oven to 375 degrees. Place chicken breasts, skin side down, in a 9 X 11 pan. 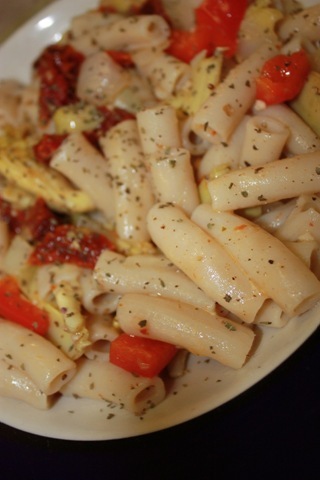 Dice tomato, chop parsley, cut bacon into 1/2 inch squares and add on top of chicken. Chop up garlic and add to top of chicken. Cut lemon in half and squeeze lemon onto chicken. Add a dash of salt and pepper. 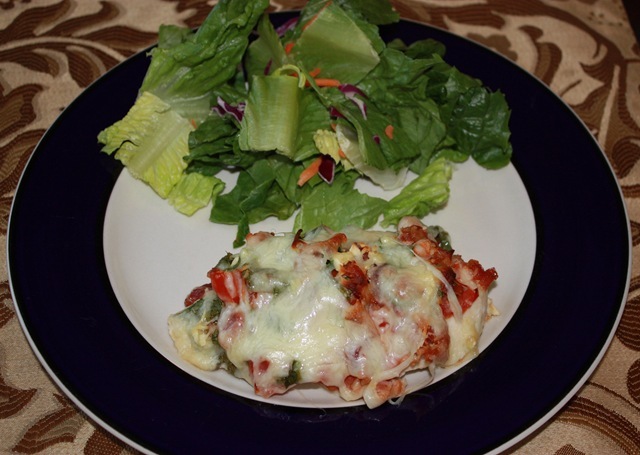 Sprinkle cheese over chicken, cover pan with foil, and bake 45 minutes or until chicken is fully cooked. Uncover foil and bake another 12 minutes or until cheese is golden brown. Plate with a fresh, veggie salad and dinner is served! Coming up next week: Lots of fabulous reviews on exciting new gluten-free goodies and products! Also, planning a vacation or stay-cation this spring? We’ve got must-have gluten-free travel toiletries!